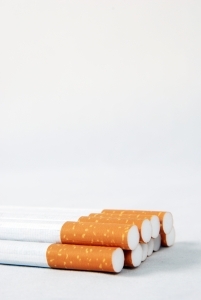 Due to the rising cost and high taxes of cigarettes throughout the country, individuals and businesses are coming up with creative ways to avoid the tax on cigarettes and tobacco. From clubs, to specialty stores, and even peoples’ homes, establishments that allow smokers to make their own cigarettes are on the rise. Companies such as RYO have installed thousands of machines throughout the nation in an effort to combat the rising costs of cigarettes, which are over $66 per carton in some states. The machines can reduce costs to as low as $20 per carton in some states, which has resulted in an industry that has quadrupled in size over the past few years. What is often overlooked by many of these do-it-yourself stores is whether allowing customers to partake in cigarette making morphs them into a cigarette manufacturer. In most states, becoming a cigarette manufacturer can impose strict and expensive license requirements as well as burdensome state taxes. For example, in January, 2013, a nonprofit club in Michigan acquired a cigarette making machine. The club purchased the machine as a convenience for its members in a non-commercial setting. Concerned as to whether this practice turned the company into a “manufacturer” of tobacco products under Michigan law, the company requested a Letter Ruling, specifically LR 2013-1, Michigan Department of Treasury, January 31, 2013. The club took it a step further and asked whether the club member operating the cigarette machine would also be a manufacturer. Being that a “cigarette making machine” was present, the Michigan Department of Treasury looked to whether the club and/or its members are “manufacturers.” Shockingly, the Department determined that any club member who operates the machine is a manufacturer and the club itself is also a manufacturer because it is permitting club members to operate the machine. This is clearly the Legislature’s intent when creating these laws. Michigan was kind enough to allow an exemption for self-consumption if the machine at issue is not a “cigarette making machine,” the machine is located at the home of the person operating it, and the cigarettes are purely for self-consumption. This exemption is almost laughable when you really think about it. First, it is tough to imagine a machine that would not meet the definition of a cigarette making machine. Further, I am sure the state is interested in expanding its resources to tax and require licensing for all of the individuals who come forward to admit their in-home cigarette production. I guess Michigan is encouraging smokers to roll their own cigarettes by hand at home? This is clearly safer than having companies do this for them.